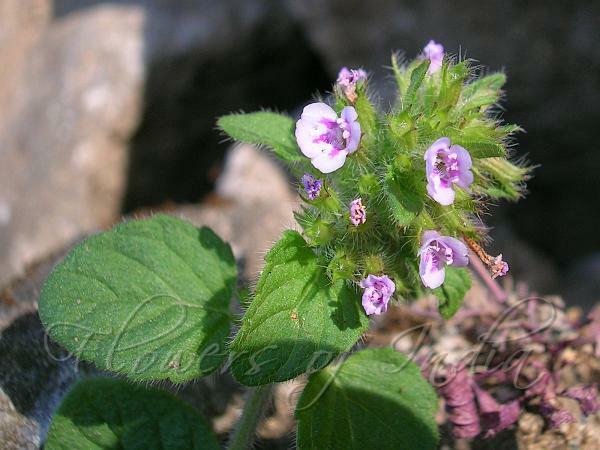 Cushion Calamint is a plant 9-18 inches in height. Flowers are pink to violet. Lower petal lobe strongly bilobed, upper petal lobe rooflike. Calyx with elongate teeth and covered in white hair. Flowers are arranged in tight clusters within the leaf axils, up and down the stem. Stem are square. Leaves ovate, heavily veined, with with nearly smooth outer margins. Plant with a distinctive aroma when crushed. Identification credit: Gurcharan Singh Photographed in Uttarakhand & Kashmir.